You are here: Home / Basics / What is Fly Fishing? What is fly fishing? 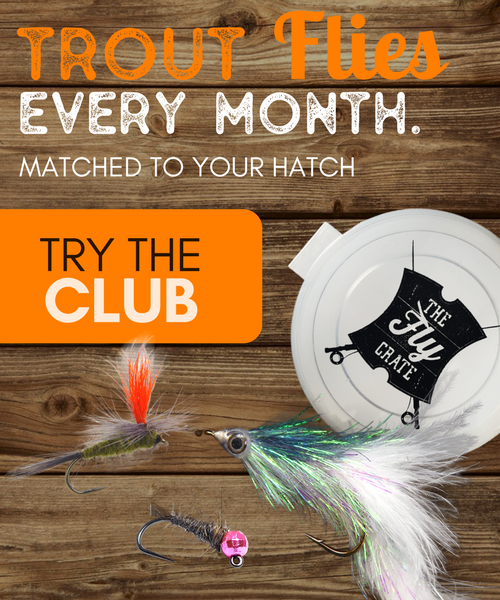 If you’re just starting out, if you recently began to have an interest in the sport of fly fishing, or even if you’ve never heard of what fly fishing is, then hopefully this article will help you. My goal is to have each of you who read this understand just what fly fishing is by the time this is over. 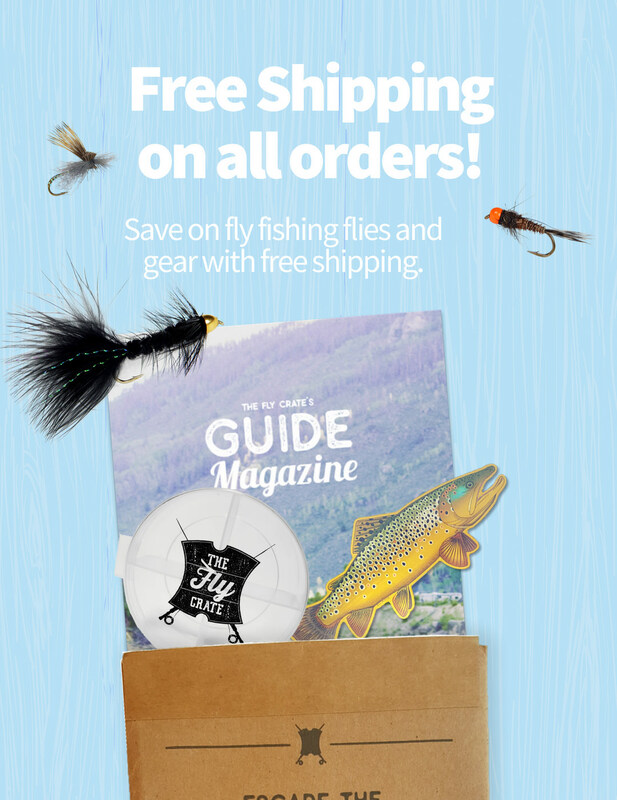 Hopefully this will also help increase your desire to learn how to fly fish and continue on to learn the fly fishing basics. With traditional fishing methods, we make a cast using some sort of lure or bait attached to the end of your line, which is typically a monofilament or any of the newer braided lines. The thing you will notice about this setup is that your line is a very thin, lightweight material and the lure or bait is the heaviest part. This makes it so that when you let that cast loose your lure or bait is what carries the momentum through the air and trails the lightweight line behind it. If you’ve ever tried casting objects this way that are very light, you’ll no doubt have noticed the difficulty in making that cast go very far at all. That weight of the lure is what is necessary in the traditional forms of fishing. The diagram below will help illustrate this. 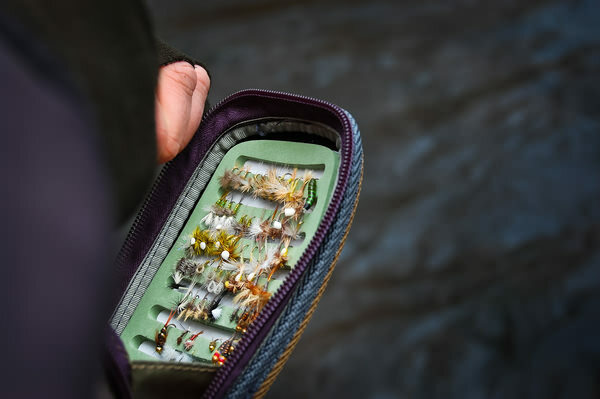 Now if you’ve ever seen someone fly cast, you’ll no doubt have noticed some very distinct differences between fly casting and traditional casting. The angler uses specialized equipment to achieve this cast. This includes the purpose build fly rod, fly line, leader, tippet, and fly. The significant difference in casting a fly is that the artificial flies used to catch fish have very little weight to them. Even when you get into fly fishing for bass or pike with the much larger flies, the weight to those is still very minimal in comparison to casting a spinning lure or other traditional bait. So how do you go about getting the fly out to where the fish are? The key is in the fly line. 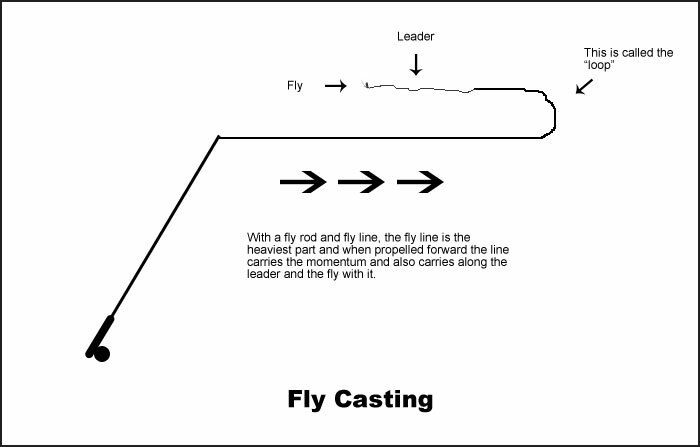 The fly line is the weight in the casting method. 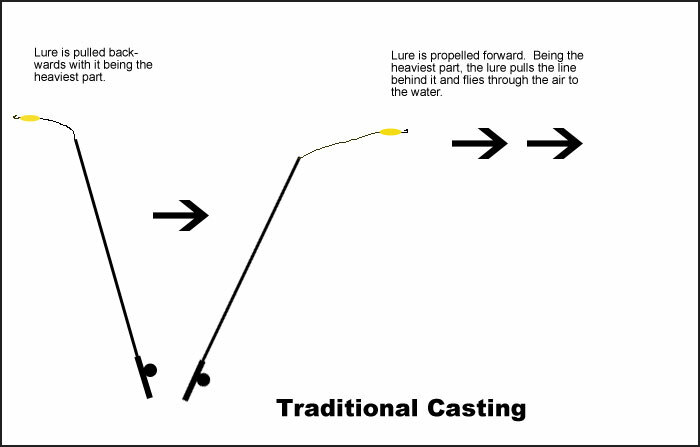 By using a casting technique that allows the fly rod and fly line to work together, the weight of the line is used to carry the fly out in front of you by transferring the energy built up in the line down through it and out towards the end of the line. The diagram below will hopefully help to show how this is accomplished by showing what is called the loop in the fly line, which is what is created as the energy transfers through the line. 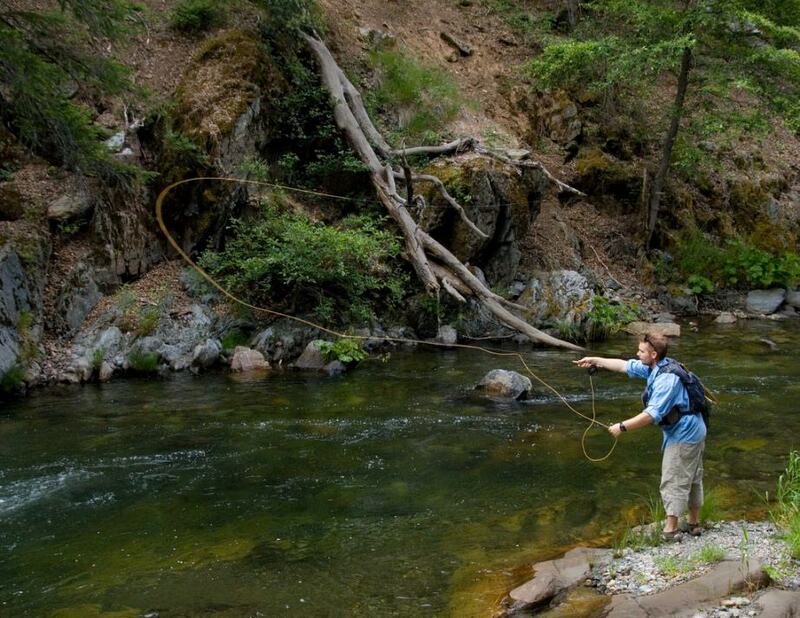 Learning how to fly cast is probably the most important aspect of fly fishing. Granted there are specific techniques in fly fishing that don’t require much casting at all, but the majority of what you will do in fly fishing involves casting. Now that we know the differences between traditional casting methods and the fly casting method that is the root of fly fishing, lets get into just what fly fishing is. Fly fishing revolves around presenting an artificial lure to a fish that is typically an imitation of any sort of insect. That is the basic concept of fly fishing. What you are trying to accomplish fishing in this manner is trying to imitate a fish’s natural food base with an imitation and getting them to take the fly. You are basically trying to outsmart, or trick, the fish. That sums up the basic information to answer what fly fishing is. The idea behind it all is that you are trying to imitate some sort of food the fish eats and entice that fish to take your fly over the other food in the water around them. Learning how to fly fish involves taking all of this information and putting it together to catch your first fish on the fly. In future articles I’ll go over the basics of fly fishing equipment, knots, and techniques that will help you learn and improve your fly fishing experience. Stay tuned and don’t hesitate to leave a comment or contact me with any questions. Tight lines everyone!